A Quiet Place (2018), (♦♦♦♦): A cataclysm has befallen Earth. Day 89. Fall. An empty city. The Abbott family—Emily (mom), Lee (father), Regan (teen daughter), Marcus (tween son), and Beau (youngest son)— are barefoot at an abandoned supermarket. They have gone to get the supplies they rely on to adjust to their new existence. To avoid making noise, they communicate via sign language. Marcus is apparently sick because Evelyn locates a prescription medication from the pharmacy’s stash and gives it to him. The youngest kid, Beau, gets a battery-powered rocket toy that his father forbade him from bringing along because it can give away their location, and plays with it on their way home, which is out of town. Suddenly the rocket makes noise and Beau is snatched by an alien creature that comes out of the woods. Day 472. Life goes on. The Abbott parents still grieve for their lost son, while Regan secretly blames herself for his death, and thinks that his father does too. Meanwhile, Lee, in his studio, tries to communicate with the outside world via Morse code S.O.S. signals that no one answers. Evelyn is pregnant again. The next day Lee and Marcus embark on an expedition to a nearby river for survival training, fishing, father-son bonding, and a little heart-to-heart conversation muffled by the river current and the roar of a nearby waterfall. Regan has been left behind, unwillingly, to care for her mom. When Regan responds to her rebellious nature and escapes home, unbeknownst to her mother, while Lee and Marcus are away, it will unleash a chain of events that will be hard to anticipate or respond to, for in a world where sound can be dangerous, there is no way they can escape it. 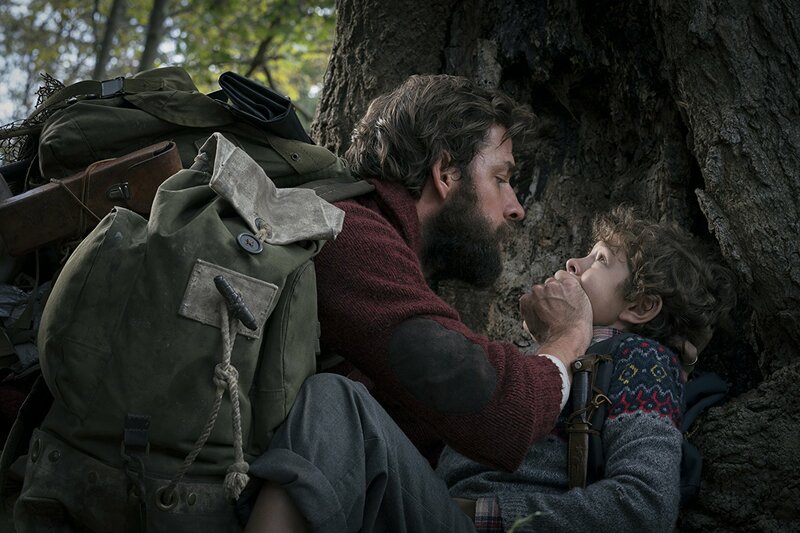 A Quiet Place is an unusual and deeply original horror film directed by John Krasinski (of The Office and 13 Hours: The Secret Soldiers of Benghazi’s fame, See Snapshots - #8), who also starred (as Lee Abbott, the father), partly produced, and co-wrote the script—he also shares writing credits with Matt Damon for Promised Land— along Bryan Woods and Scott Beck. 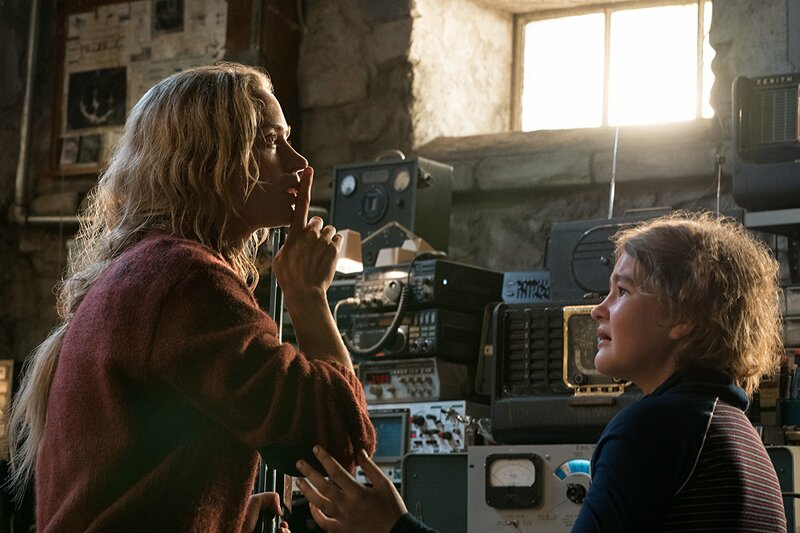 In A Quiet Place also starred Emily Blunt (Evelyn Abbott), Millicent Simmonds (Regan Abbott), and Noah Jupe (Marcus Abbott). 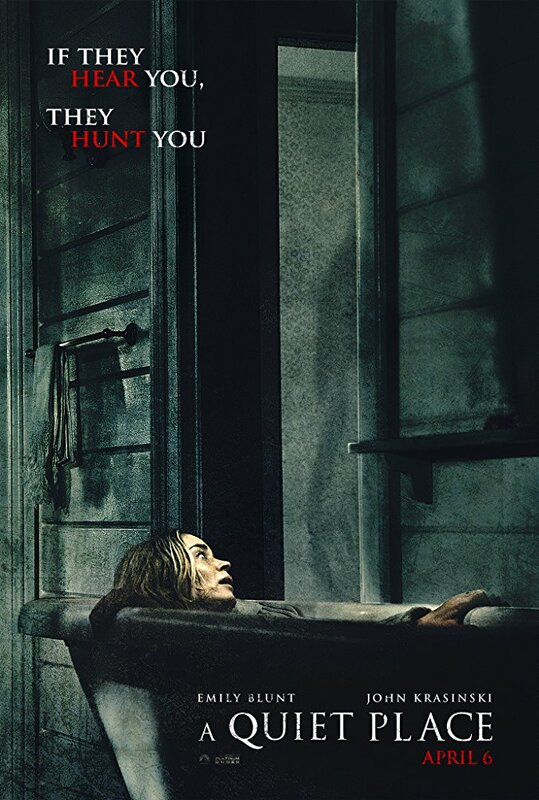 With a running time of 90 minutes, A Quiet Place is a movie that besides getting high nods for great acting and direction, and the originality of its screenplay, also gets kudos for great editing, since it is a solid entry in the horror genre that makes a great case in the shortest amount of time a movie runs for with seamless scenes transitions. The musical score, or rather the eclectic mix of sound in the movie, from heartbeat echoes, a Neil Young song, rare instances of screaming and conversation muffled by a river current and the roar of a waterfall, alien screeching, static noise, and ever present eerie, atmospheric music so characteristic of alien movies, contribute to enhance the emotional rollercoaster this film spans. The ordinary life of this family is punctuated by bursts of terror, emotion, and tenderness quietly expressed: teenage rebellion, kids being home-schooled as much in school subjects as in survival techniques, tender caresses among family members, sporadic humor via sign language, as well as a rare instance of silent dancing to music listened through earbuds between Lee and Evelyn, while Evelyn is pregnant. There are no cheap thrills in A Quiet Place. The horror of their lives being threatened by aliens that are attracted by sound, is genuinely conveyed in the actors’ faces, eyes, their gestures...As a consequence, the occasional terror (there are few but not cheaply offered) are deeply felt by the audience and appreciated even more—I gasped out loud a few times. This is one of those movies that relies heavily on the emotions the actors convey through their physical expressions rather than what is spoken—for loud speech is rare in this film—and all of them do a wonderful job of exploring the inner lives of their characters as well as the way they interacted with each other, taking as a source the unusual and rather marvelous screenplay. Another great element of this film is the infrequent but scarily effective use of the alien creatures. The aliens are portrayed convincingly—they look chillingly real, and maybe as true to life as any alien seen in sci-fi movies, which this film is not. The menace is consequently felt because of it, although a great deal of that effectiveness is due to the music effect. 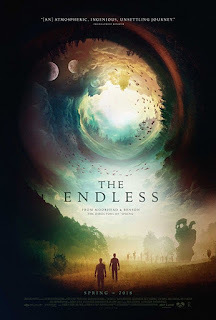 The Endless (2017), (♦♦♦½): Ten years ago, brothers Justin and Aaron left a UFO death cult they had lived in since they were kids. Aaron misses the sense of community and purpose he had before. Justin argues that Aaron’s memories are clouded. When Aaron receives a video tape from one of the cult members, a goodbye video of sorts before a transformative event, Justin agrees that they can go back to the commune for one day and one night so Aaron can have closure. When Justin submerges on the nearby lake and extracts a metal box that reveals lies he wasn’t ready to admit, Aaron decides to stay at the camp permanently. Justin wants to leave but won’t leave his younger brother behind. Outside the camp, he encounters a man with some answers; just not ones he is ready to accept on blind faith. However, he soon finds out that what the man says is true. Now Justin has to find his brother and escape the camp, if they can, before it is too late for them, or before the third moon in the sky is full, whichever comes first. The Endless, a film with a running time of 111 minutes, was written by Justin Benson, who also starred, and directed by Justin Benson and Aaron Moorhead—the director-duo of the cult classic Spring. In it starred, Aaron Benson (Aaron, Justin’s younger brother), Callie Hernandez (Anna), Emily Montague (Jennifer), Lew Temple (Tim), James Jordan (Cal), Tate Ellington (Hal), Kira Powell (Lizzy). The Endless is an imaginative, mind-bending, slow-burn thriller so unique that is one giant ball of weirdness. It comes a little close to a development from another rather intriguing series on premium television right now, just one twist, which in this movie sort of gives away the ending, reason why I don’t want to identify the series. The Endless showcases beautiful cinematography and photography, in the few instances when they are allowed to shine; that is, away from the cult community, showing the rarity of events that surround the camp. The special effects aren’t expensive, but they are organically incorporated into the story and, when they appear, they are aesthetically pleasant and enhance the message of the movie. There are underlying themes of free will, fate and destiny, and fear of the unknown. The fact that The Endless takes place vastly within a cult community, reinforces the themes addressed in the film. The eerie, atmospheric musical score is a not so subtle hint that there are sinister things happening, and a more obvious clue—for those who know how to interpret it; I was not one of those—is the continuous, distorted playing of the song “A House in New Orleans”, which is in itself, the most revealing clue in the movie of what really goes on. Bombshell: The Hedy Lamarr Story (2017), (♦♦♦♦): the woman behind the face of Snow White, and whose eyes inspired Catwoman, movie icon Hedy Lamarr had all but a charming life. She was born in Vienna in 1914 to a wealthy, cultured, Jewish family. Her father got her interested in science, and from an early age she wanted to know how things worked, which led her to inventing and tinkering with gadgets. Her beauty most likely derailed a career as a scientist, for at the age of 16, she walked into a movie studio and two days later got a part. In 1933, Hedy starred in the film Extase, in which she made a naked scene, considered so scandalous that labeled her for life as a certain kind of woman. She married an Austrian arms industrialist associated with the Nazis. The marriage ended before she left Austria for London in 1937, when the threat of impending war and the increasing taking away of civil liberties from Jews in Austria, likely caused her father’s death. She sailed for America that year in the SS Normandie, the same ship in which Louis B. Meyer, Head of MGM, was traveling. Hedy made sure to parade in public during the voyage, and wore a dinner gown that made Meyer sign her up as a star for his movie studio. Her first role in Hollywood was in Algiers. Fame came after filming Boom Town (1940), opposite Clark Gable. The war years were very prolific career-wise, though she had to suppress her Jewish heritage at the urging of L.B. Meyer. Between 1940-1946, she associated with Howard Hughes, and made modifications to the shape of his plane’s wings. She also conceptualized an invention of a radio-controlled torpedo that couldn’t be jammed because it varied the frequencies transmitted (frequency hopping). Her friendship with pianist/inventor George Antheil and a technical professor led to the patent for this invention that would have saved countless lives during WWII had it been implemented. The U.S. Navy shelved the patent. After disputes with Louis B. Meyer and being sued by him, Hedy Lamarr began producing her own films (the first movie star to do so, a woman nonetheless!) She didn’t find the success she expected in that enterprise. By then, her third marriage had ended and she had to rear up two children on her own. She went back to filming movies. Cecile DeMille hired her to star in Samson and Delilah (1949), which was her biggest success and the second highest grossing film of the decade, after Gone with the Wind. She again produced an epic film in the manner of the epics of the era, but the movie didn’t find a distributor and her fortune dwindled. 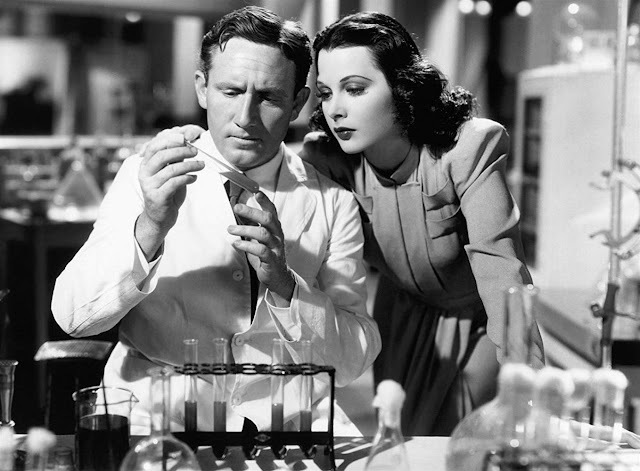 Three failed marriages and several scandals later, Hedy got hooked on the “vitamins” provided by “Dr. Feelgood”; she began to behave erratically. More scandals followed. In later years, Hedy became a recluse. Her fortune was spent. By the time of the Missile Crisis (1962), all the ships that participated in Cuba’s blockade were equipped with the technology she had patented. However, because her patent had expired in 1959 and she never claimed the six-year extension for authorship and payment, she was never compensated for her invention. Ironically, frequency hopping has found practical applications in Bluetooth technology, secured Wi-Fi, cell phones, GPS, and military satellites. While her invention is estimated in $30 billion USD, she never made a cent of something that has become ubiquitous in modern life. Pieced together using composite images of newspapers, magazines editorials and covers, patent images, her most iconic movie scenes, and through personal interviews with family members, journalists, inventors, and two movie stars, the life of Hedy Lamarr—the person behind the myth: actress, inventor, trailblazer, and pioneer—emerges in full glory. She didn’t live a charmed life despite her iconic beauty; moreover, it seems that her beauty got in the way of the person she truly wanted to be, but she proved against all odds that certain people cannot be constrained by stereotypes. They break the mold, they shine regardless of the darkness that surround them. Hedy Lamarr was like that. Don’t miss this biographical/historical gem! I just saw Bombshell. I thought it was a gem too! A Quiet Place: well you make it sound like maybe I should overcome my aversion to horror/zombie movies. But I am not promising anything-:) I might check out the UFO cult film though because of my friend's husband's involvement with that area of life. OK. I am putting A Quiet Place in the queue. And thanks for the extra explanation. I've always been fascinated by Hedy Lamarr's story. Such an interesting human being with so much more to her than appeared on the surface. I'm also a fan of John Krasinski and I've heard and read a lot of good things about A Quiet Place. Based on your review, it sure sounds like a winner. Parenthetically, my husband and I have recently been watching The Office from its beginning. I never watched it regularly when it was on television and I'm greatly enjoying getting to know these quirky characters. Just the antidote to reality that I need these days! Yes, Hedy was the whole package. John Krasinski has revealed a great talent in front and behind the camera. Can't wait to see what he does next. What a coincidence about you watching The Office. It sure is an antidote to reality nowadays. I'd like to see Bombshell. I don't know much about Hedy's story, but hers sounds like quite a life and tragic too. I'm not drawn to horror or sci-fi flicks but there are exceptions. I will keep an open mind on these others. thanks! I highly recommend you Bombshell. 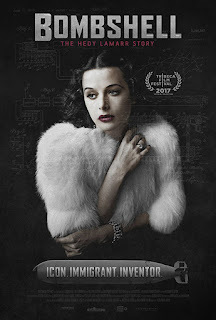 I didn't know about Hedy's life either, but the documentary is quite enlightening. You are right in saying that her life was tragic. She was so unappreciated and misunderstood! If you have to choose between the other two, I recommend you A Quiet Place more than the other. You saw Get Out after all. While it is different than the latter, A Quiet Place is as unsettling and different as Get Out was. I think you would appreciate it. Thanks Carmen. I think I will see A Quiet Place from your comments and all the buzz. I did like Get Out quite a bit! Good. Let me know how you like it. Wow, I had no idea about Hedi Lamarr's lifestory. It sounds absolutely fascinating and this is a film that I would definitely enjoy. 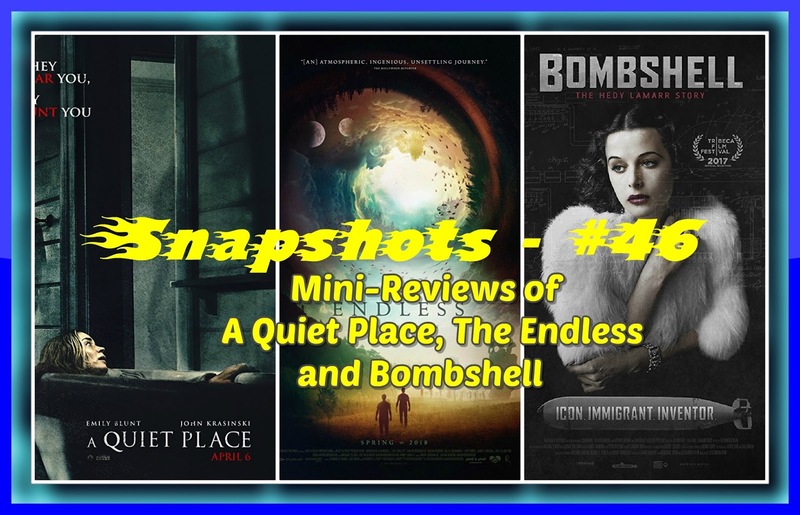 I loved A Quiet Place too - very unusual and definitely made me squirm at certain parts - just the right amount of tension and fear I thought. I think you would like Bombshell too, Lynn. I agree about A Quiet Place. Lately, horror films are getting more unusual in the way it matters; better quality too. Carmen, I haven't watched any of these and none of them on face value are watches I would usually go for: horror, cults, etc. However you made them all sound fascinating! Thanks, Jessica, though I assure you that you have nothing to fear; their plots sound worse than they actually are. 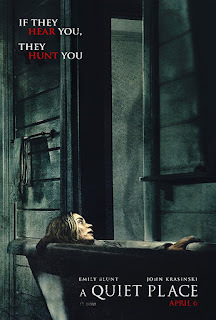 For A Quiet Place, the "horror" label should be used rather loosely. It has as many scares, perhaps even less, than your typical alien movie, and none of the gore. I think you would like it if you gave it a chance.